Award winning marketing and communications agency Brass has offices in Leeds. The agency provides insight, strategy and creative services to local, national and global brands. It has won multiple awards for its marketing campaigns delivering results in digital and shopper marketing, PR, lead generation, customer acquisition, brand awareness and sales. The company invited its 90 strong Leeds team to a head-turning creative Christmas party being staged at The Mansion, Leeds. Designed to showcase and reward staff achievement over the course of the year, the Brass Christmas party is renowned for its creativity and spectacle, and this year was no exception. 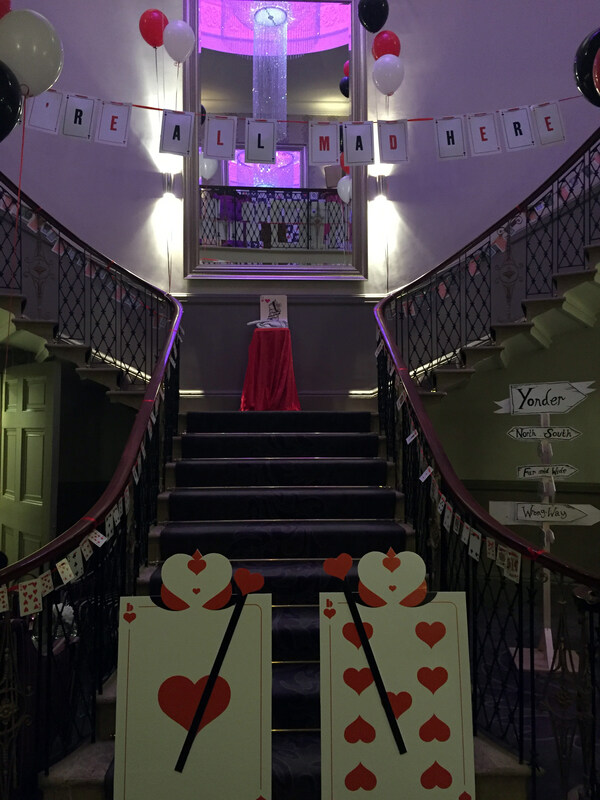 With a party theme of ‘The Mad Brassers Tea Party’, The Mansion was chosen as the perfect venue in which to showcase the quirky and extravagant decorations and props used to create the event. The Brass Agency Christmas Party was hosted in The Mansion room with a selection of oversized ‘Alice in Wonderland’ props hired especially for the occasion; including a giant chess set, inflatable ‘croquet’ flamingos and oversized ‘drink me’ bottles. Added to this was a variety of bespoke decorations, uniquely created by Brass agency’s internal creative team. Topping off the event, Brass brought along a fully ‘in character’ Mad Hatter as an alternative ‘Master of Ceremonies’ along with hiring a close-up magician to wow the attendees during pre-dinner drinks. Guests arrived at the venue located 15 minutes from Leeds city centre from 5.45pm and were greeted with an arrival cocktail in the Grand Staircase Hall. 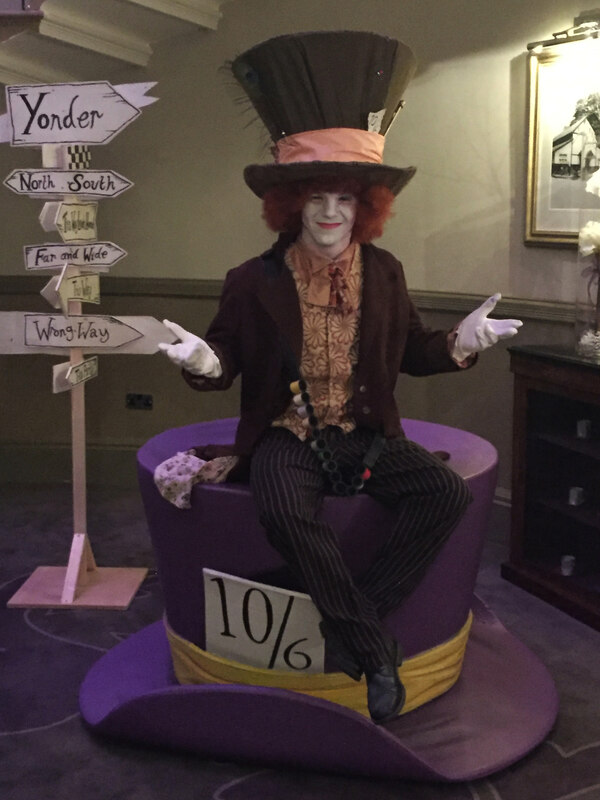 Guests were offered the opportunity to take photographs with supplied props and the Mad Hatter himself offering an opportunity to post on social media. Those who felt so inclined could test their strategic skills by taking part in a giant chess game in the Colonnades, or have a game of flamingo ‘croquet’. 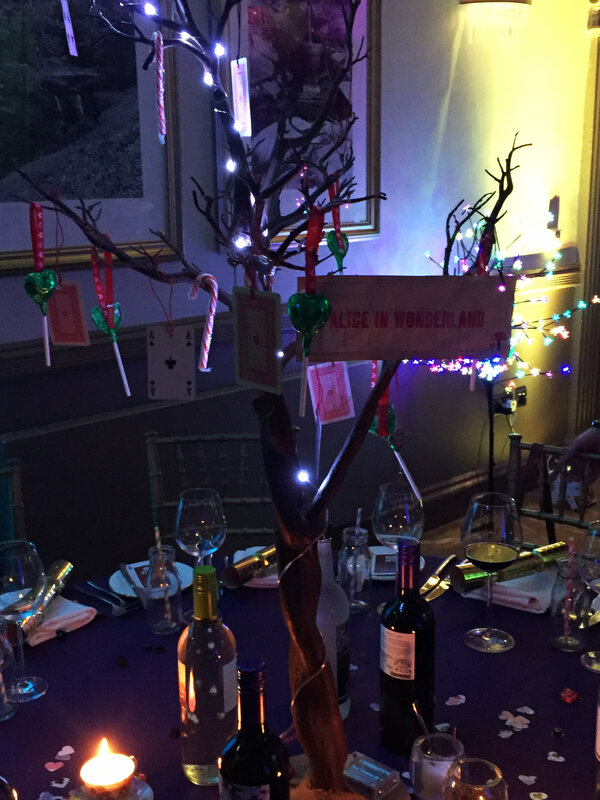 Following drinks and canapés, guests were invited to dinner in The Mansion room which had been meticulously decorated with fairy light ‘trees’ and centre-piece ‘branches’ from which were hung a selection of chocolates and trinkets, all following the ‘Mad Brassers’ Alice in Wonderland theme . Background music was provided by the Dine DJ while the bar provided a selection of drinks to accompany the three course meal. From 9.00pm, a Brass ‘Awards Ceremony’ was staged, celebrating the individuals and achievements of the agency throughout 2016, while desserts were served. The evening was rounded off by entertainment from the Dine DJ until the small hours.